Necklaces are said to be one of the earliest forms of adornment worn by humans. Their enduring popularity is evident through the ages. Ancient civilizations favoured necklaces for decorative, ceremonial or religious purposes, and to this day they can be used as a symbol of wealth and status. 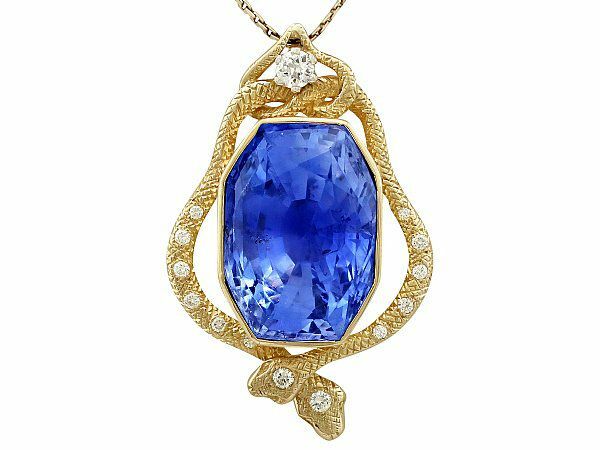 With a history spanning centuries- and the world- it is unsurprising that there are innumerable different styles of necklace. 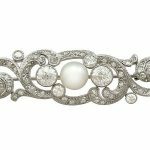 From bayadère to rivière, antique necklace styles encompass a whole range of eras that evidence their incredible success as a jewellery piece. This being said, the sheer volume of antique necklace styles out there can be slightly overwhelming! 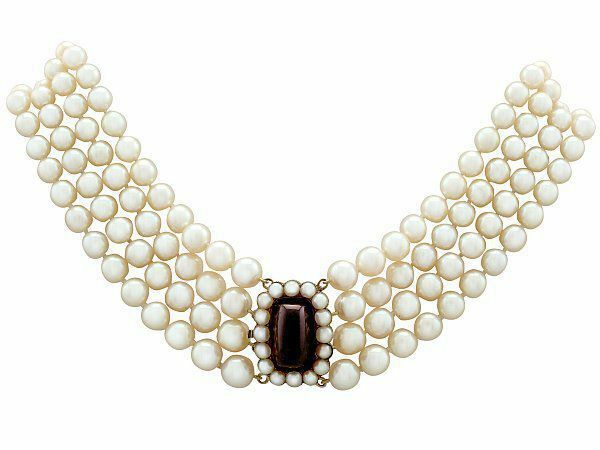 Never fear though, as we have compiled a beginner’s guide to antique necklace styles that will ensure you can find the perfect style for you. We’ll break you in gently with the pendant. 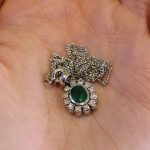 Deriving from the French word ‘pendre’ (meaning ‘to hang’) a pendant is simply an object suspended from something else. So when an ornament hangs freely from a necklace, it forms a pendant. Most ancient and modern cultures have admired this form of necklace, whether it is worn as a talisman for luck, a religious symbol or simply some glamour. 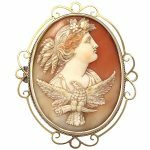 Pendants are incredibly versatile, and can vary in size, length and decoration. 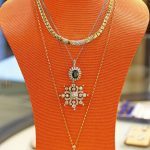 Whether you prefer a subtle, dainty piece or something more ostentatious, there is certainly a pendant necklace out there for you. Next up is the bib necklace. It’s a lot more stylish than it sounds, we promise! The bib necklace is a large, dramatic piece of jewellery- perfect for those who love to make a statement. 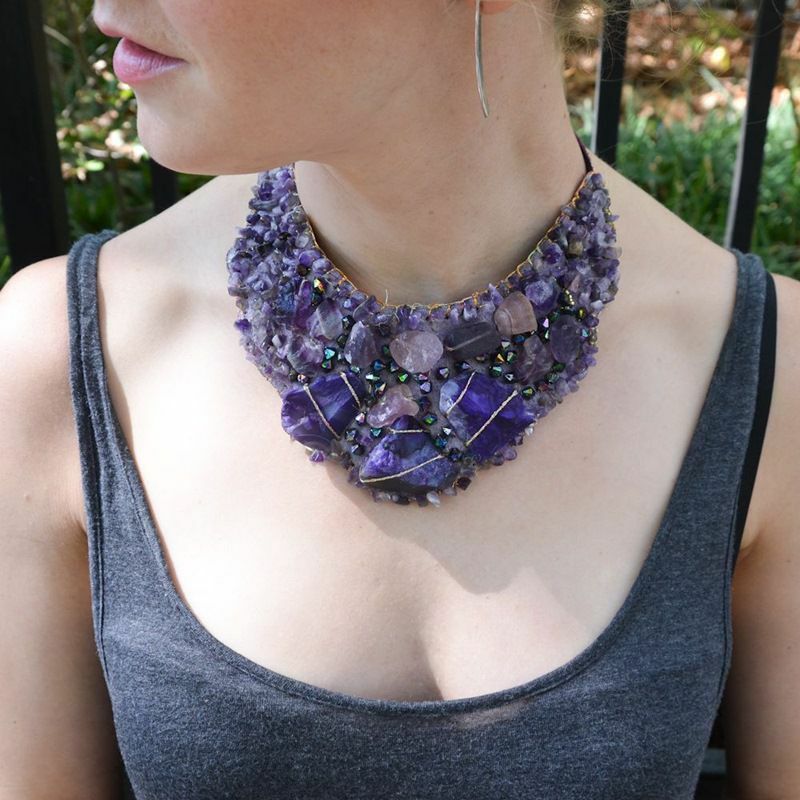 Bib necklaces are predominantly triangular or circular in shape, and can be made from a variety of materials such as silver, gold and gemstones. The bib style is truly timeless; examples can be dated back to the ancient Greek and Roman times. Whilst the concept is old, this style was periodically revived to ensure it was in keeping with the fashions of the time it was being worn. Now, bib style necklaces are often used to complement low cut evening gowns, as their vivid presence makes them perfectly suited to such an occasion. 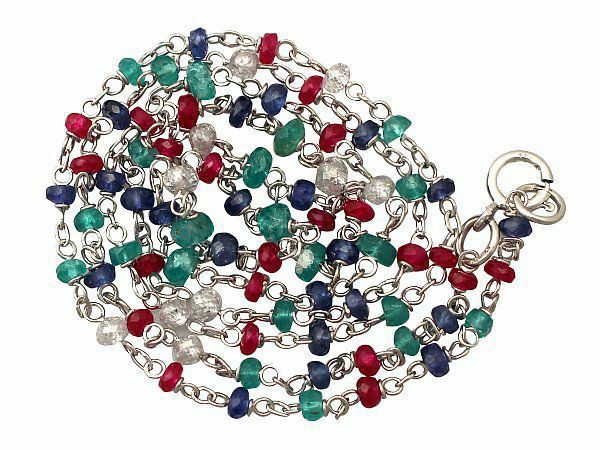 If you’ve lived through the 90s, you’ll be more than familiar with this style of necklace! The choker is a short necklace that sits very high on the neck (or occasionally just below the collarbone). It is often composed entirely of stones or beads that are uniform in size, although there are many stylistic variations on this. Whilst the choker has seen a more recent surge in popularity, its origins actually go back way further- to ancient Samaria in fact. From then to now, the choker style has periodically gone in and out of fashion. This is largely due to the styles of the time. For example, when necklines on garments were lower, people utilised the choker to make a statement. Chokers would be lavishly layered over one another, until the neck was hidden behind a swarm of luxury. This is where it may get complicated. First of all, a collar necklace is not to be confused with a choker necklace! Where a choker sits on the neck, a collar necklace sits flush against the skin, resting directly above the collarbone. 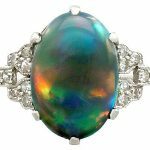 It can be made of a wide variety of materials, including intricate gemstones or beads. However, whilst a collar necklace is not a choker necklace, a choker necklace was once considered to be a collar necklace. Confused? Us too! Basically, at one point the term collar was used to describe ALL necklaces. This is because the literal translation of collar is applicable to anything worn about the neck, whether that be clothing, flowers, fur or jewellery. A collar necklace now however, refers specifically to the type of ornament we have described; a necklace that sits above the collarbone and surrounds the neck. The French know how to do romance, and the rivière style necklace proves it. The rivière necklace is so named because of the beautiful way it falls. Translated from French it means ‘river’, which refers to the way this style flows gracefully around the neck. This style of necklace achieves its beauty from simplicity. It is often simply strung with a line of gems or rhinestones, individually set, and often graduating in size. When this style initially developed in the late 17th century, it possessed a closed-back setting. Later versions featured open settings, which created a continuous, shining stream around the neck. Très romantique! Now onto a commonly misidentified style; the festoon necklace. By definition, a festoon is a garland of flowers or ribbons hung in a curve as a decorative element or incorporated into a building as an architectural feature. As such, a festoon necklace must have a curved design featuring swags or drapes of chain, beads, or metal bindings. Other elements may be incorporated, but no swag= no festoon. This style of necklace was popular during the Georgian and Victorian eras, and often incorporated swags of jet or garnet. Named after Louise de La Vallière, a mistress of Louis XIV, the lavalier style necklace has been around for centuries. It consists of a necklace with small links that culminates in single drop pendant- this often features a pearl. This main ornament can often have additional decorations dangling from it. Although it is Louise de La Vallière who brought the necklace to fame, this style is usually associated with the early 20th century. 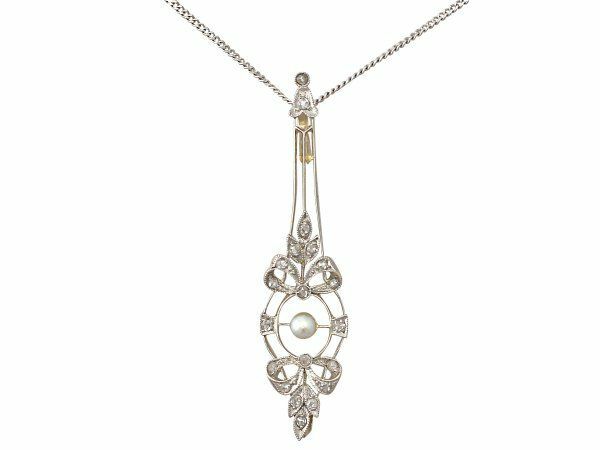 The delicacy of the lavalier style necklace was perfectly suited to the Edwardian era, where styles favoured pastel hues and dainty designs. The sautoir necklace consists of a long chain or beaded necklace, and terminates in a tassel or pendant. Whilst this is also a feature of the lavalier style, the sautoir is far longer and more substantial in width. In French, sautoir translates to ‘jump rope’, which makes sense, although we can think of better uses for stunning antique necklaces! 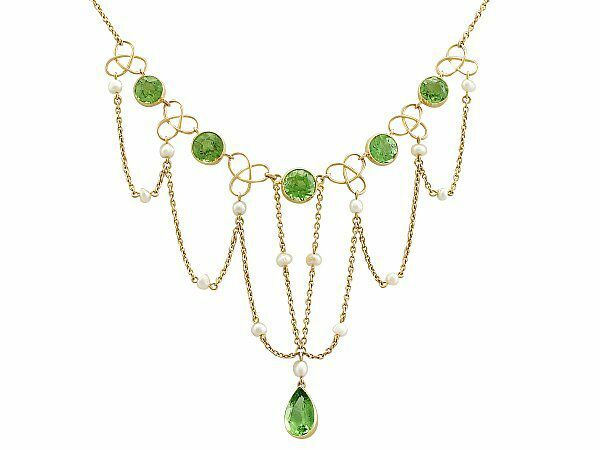 This style is probably most recognisable as a ‘flapper’ necklace. Frequently looped around the neck and worn scarf-like over one shoulder, the sautoir necklace is instantly recognisable as one of this era. In keeping with fashions of the time, it was occasionally worn dangling down the back to accentuate a low cut evening gown- the scandal!